Ericsson (NASDAQ: ERIC),Telstra and Ciena have successfully trialled continuous data encryption while maintaining speed and reliability over 21,940 km across multiple cable systems. 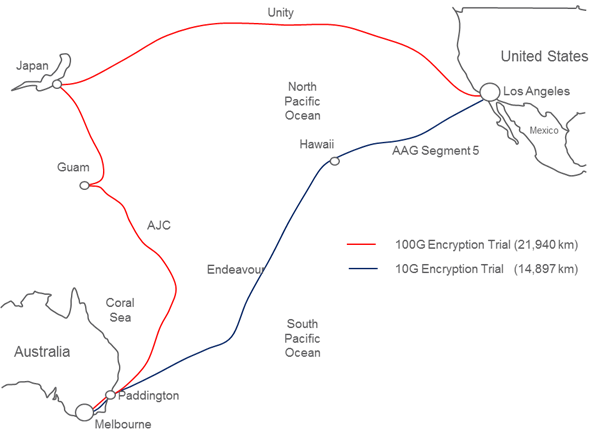 The engineering teams demonstrated the ability to encrypt data securely while in transit between Los Angeles and Melbourne at 100 Gbps, using Ciena’s ultra-low latency 100 Gigabit wire-speed encryption solution. With the digitalization of business processes and data consumption rapidly rising, the need to keep data secure without compromising integrity or significantly increasing latency is essential at both the application and network layers. Organizations with higher security obligations, such as those in the Finance, Healthcare, Defense, and Government sectors, as well as Data Center Operators, will be particularly interested in this new encryption technology. Testing this functionality is an essential step in the path towards commercialization so Telstra can be sure of service quality prior to deployment. Darrin Webb, Executive Director of International Operations and Services at Telstra, says: “This demonstration shows that customer services with large bandwidth requirements can be secured and data transported across virtually any distance and over an underlying network that uses multiple vendors. This means we can provide service consistency regardless of the cable system used. Customers will also be able to protect their data not only at the application layer, but also at the network layer without any reduction in quality. “Enhancing our network leadership in the Asia Pacific region is a priority for us and this innovation continues our commitment to providing customers with a world-class network experience,” says Webb. While encryption solutions exist today to protect data when it is ‘at rest’ (at the start and end points), this trial demonstrates the advanced security that can be delivered while data is ‘in transit’, that is, being transmitted beyond the walls of a data center across extensive networks, without any impact to performance. Telstra is a leading telecommunications and technology company. We offer a full range of services and compete in all telecommunications markets in Australia, operating the largest mobile and Wi-Fi networks. Globally, we provide end-to-end solutions including managed network services, global connectivity, cloud, voice, colocation, conferencing and satellite solutions. We have licenses in Asia, Europe and the United States and offer access to more than 2,000 points of presence across the globe. Ciena (NYSE: CIEN) is a network strategy and technology company. We translate best-in-class technology into value through a high-touch, consultative business model – with a relentless drive to create exceptional experiences measured by outcomes. For updates on Ciena, follow us on Twitter @Ciena,LinkedIn, the Ciena Insights blog, or visit www.ciena.com.